It is absolutely prime season for hikes near Mount Hood. 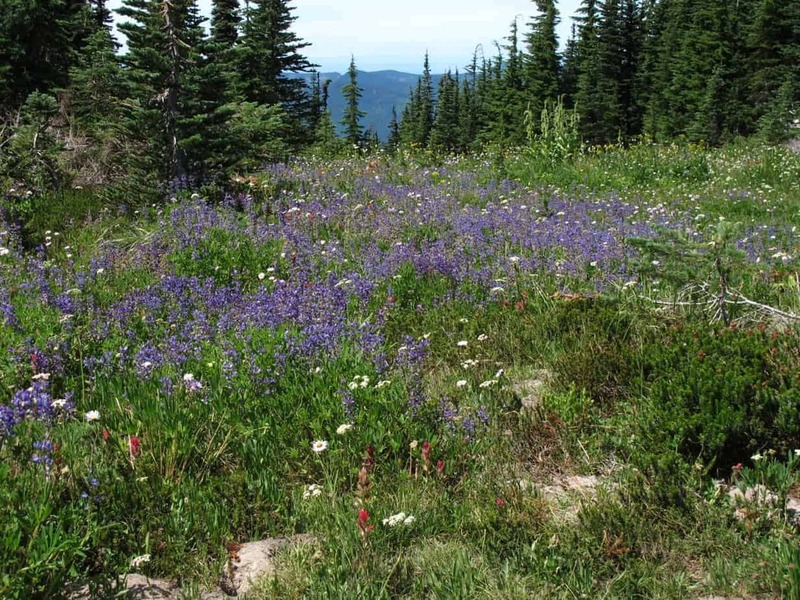 Right now, the flowers are blooming all over the place, the weather is perfect, the bugs are dying off … all in all, if you’re looking for a Mount Hood hike, now is the time. And McNeil Point is the place. And in my opinion, there’s no better hike than the trek up to McNeil Point. 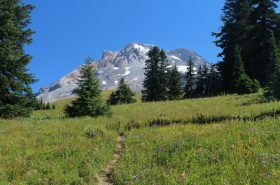 In fact, now that Vista Ridge is burned up, McNeil might be my favorite Mount Hood hike. 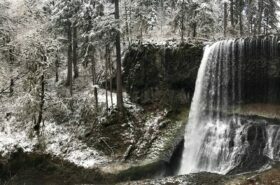 Here’s a brief writeup about it; for more, see my book, 60 Hikes Within 60 Miles of Portland. 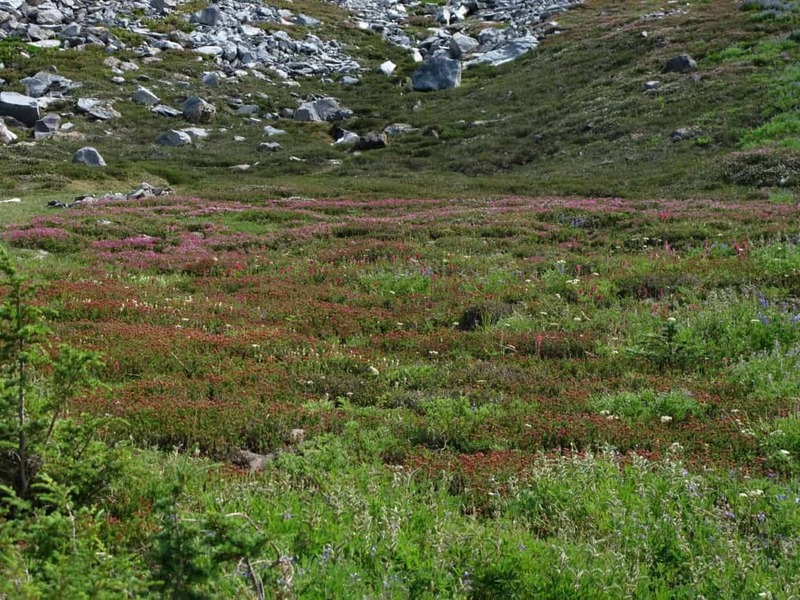 Vista Ridge is fascinating specifically because it all burned up, and the meadows up there are still amazing, but McNeil has it all: old forest, babbling brooks, wildflowers, meadows, awesome mountain views, and even the chance to get right up close with a glacier. And honestly, it’s not all that hard. Even if you push on to the point and above – and you’ll see plenty of beautiful stuff, even if you don’t – you barely gain 2,200 ft. over about five miles getting there. This hike rarely even approaches being “steep” the way I do it. Wildflowers along the trail to McNeil Point. I used to show this the same as everybody else: about 9 miles roundtrip. On this last hike my GPS showed 10.2 miles roundtrip, and based on how long it took, I tend to believe that. 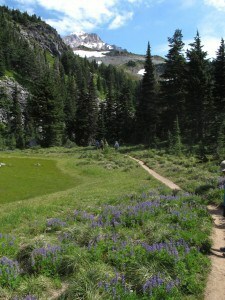 Anyway, the elevation at Top Spur Trailhead is 3,960 feet; the ponds, a little over 4 miles up, are at 5,500 feet. 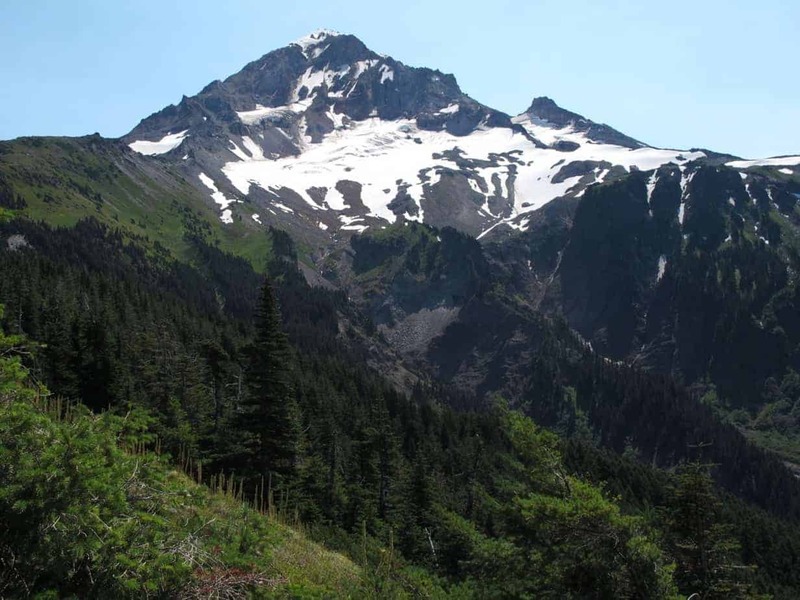 The highest point on the hike, just before the shelter, is 6,100. At my standard pace – walking 2 mph, making 1.5 including breaks – this hike took about 6.5 hours. The larger pond below McNeil Point dried up this summer. 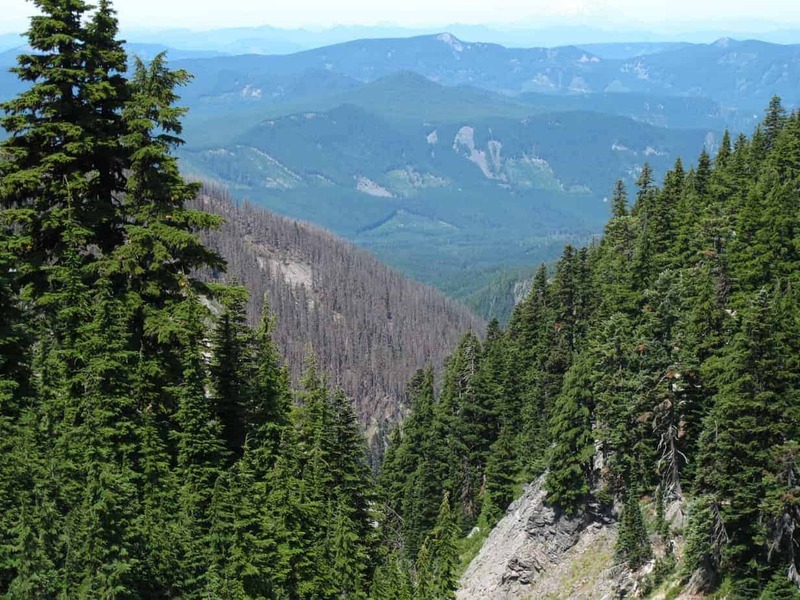 Take US 26 from Portland, driving 36 miles east of I-205 to Zigzag, and turn left onto Lolo Pass Road at the Zigzag Store. 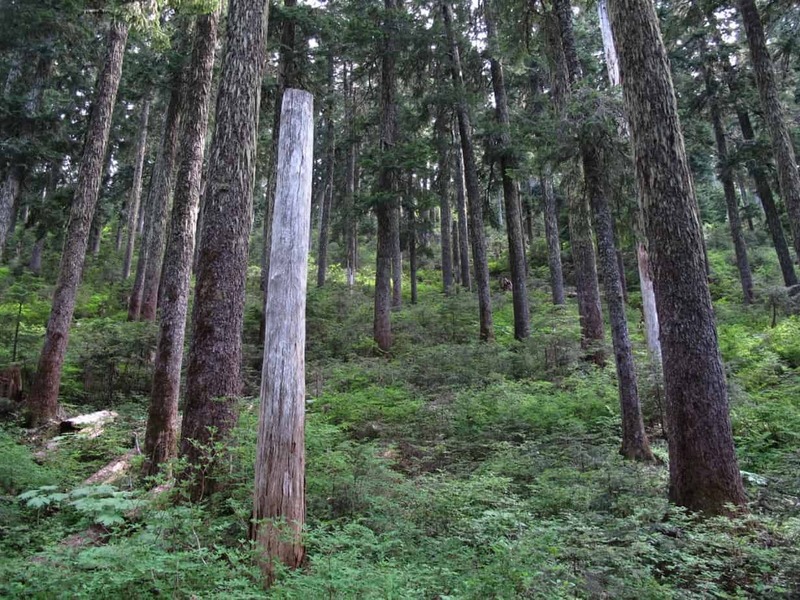 Go 10.6 miles to Lolo Pass and make a right onto the paved FS 1828, which is the first right at the pass. Go 3.1 miles and turn left onto the gravel FS 118, following a sign for Top Spur. The trailhead is 1.5 miles ahead on the right. 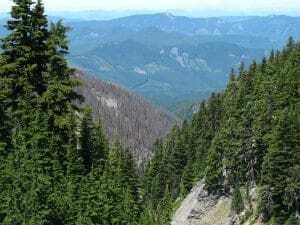 But Lolo Pass Road is closed through Labor Day. You have to take a detour after taking the left off US 26. Check the Mount Hood National Forest website for details. Cathedral forest on the Timberline Trail. 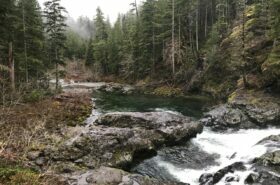 [/twocol_one] [twocol_one_last]Shortly after this, duck through the woods on a left-hand trail to rejoin the Timberline Trail, climbing through the forest. 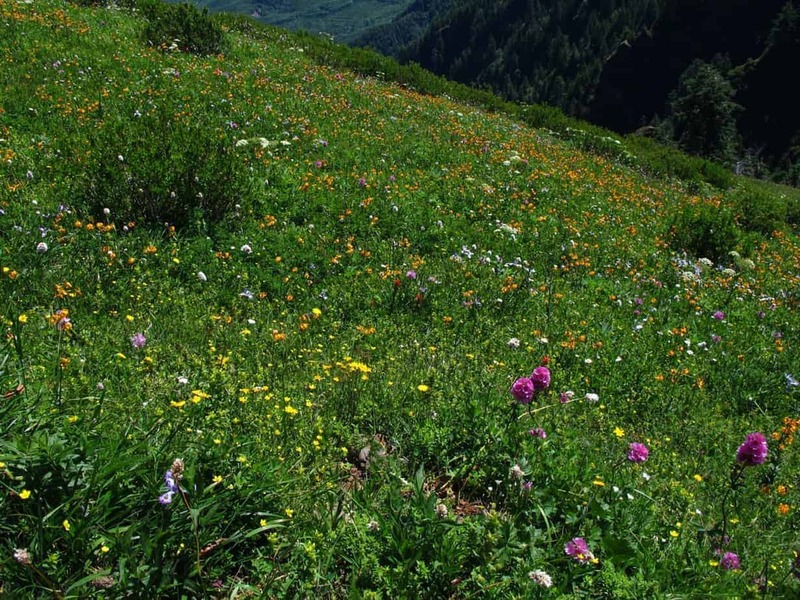 You’ll pass a couple of meadows with more views of Hood, then enter the High Country of creeks, flowers, meadows and ponds. 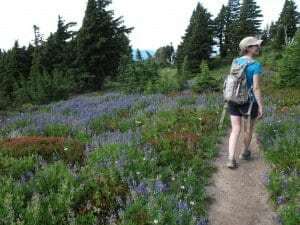 [/twocol_one_last] At about 4 miles up, you’ll see the trail headed right to McNeil Point, following a small ridge and then crossing rocks and, perhaps, some snow – all this among blooming heather and wildflowers. At a Y junction, stay right to reach the 1930’s era stone shelter at McNeil Point, with, yes, even more amazing views. 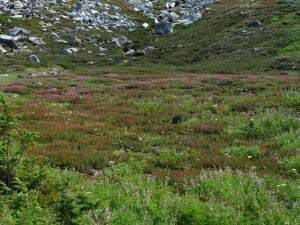 Heather Blooming along the last stretch of trail to McNeil Point. Did I mention there are flowers up here? 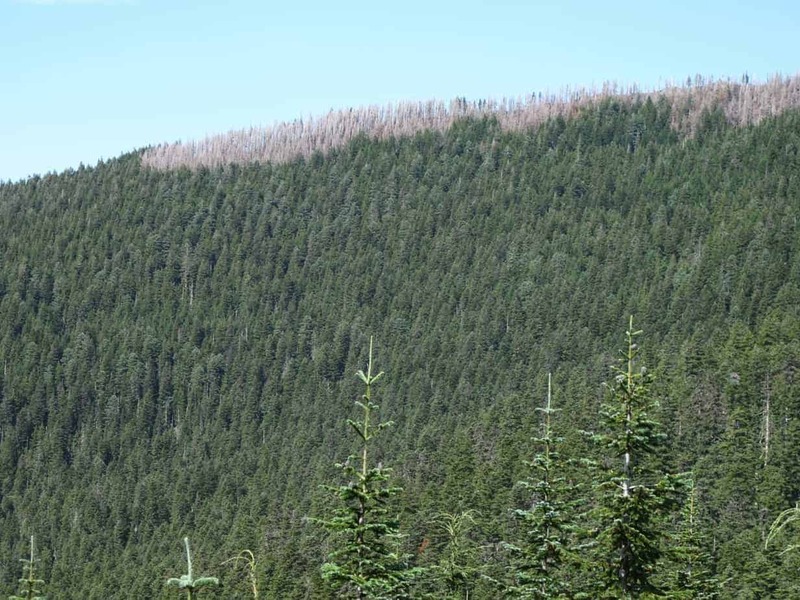 [/twocol_one_last]One interesting aspect of this hike is that you can look down onto the results of a recent, massive forest fire: the 2011 Dollar Fire, which really toasted the Vista Ridge hike. From McNeil and the trail to it, you can see the contrast between when burned and what didn’t, and see the vagaries of fire boundaries. 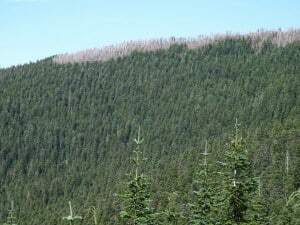 Evidence of the 2011 Dollar Fire on the way to McNeil Point. Crazy how the Dollar Fire just kind of … stopped here. 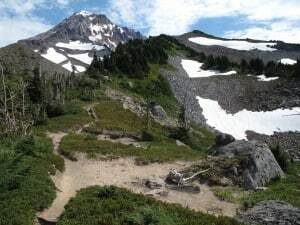 [/twocol_one_last] From McNeil Point, you can follow a user trail above this for even higher country, and eventually get out between the glaciers, but don’t go on those unless you clearly know what you’re doing and have the right gear. See what I mean about a honey of a hike? 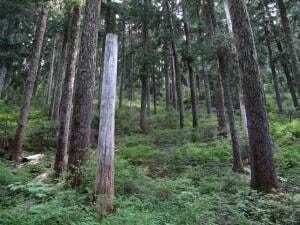 Great forest, classic view without much trouble, shortcuts, meadows, ponds, creeks, and killer views all over the place. There’s no other way to say it; it’s a honey of a hike! 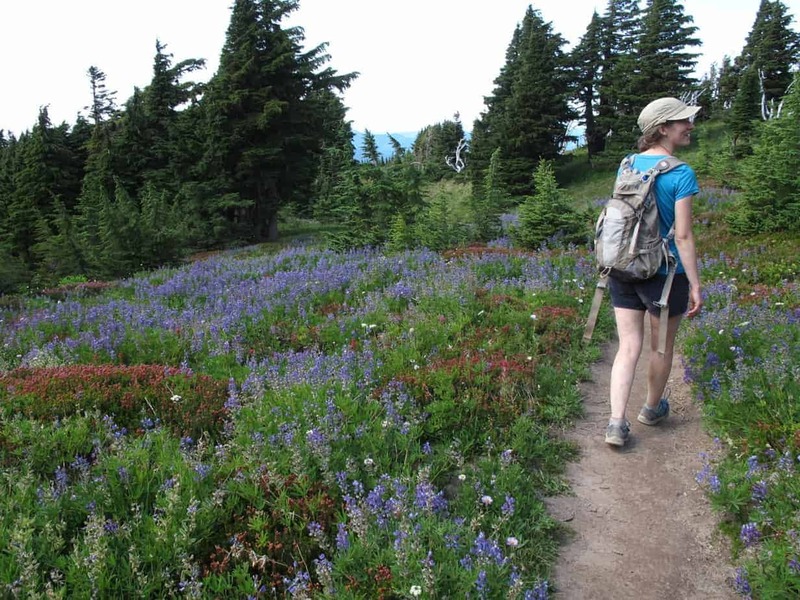 Portland-Area Hiking News and Conditions For August 14: Flowers, Flowers, Everywhere!